Last century 60’s are known by many bright personalities, which affected and told dress code and living style in society. Everybody remembers and even now calls up JacquelineKennedys low-keyed costumes, characteristic oval collar and classical style straight dresses. Actresses AudreyHepburn and BrigitteBardot – complete generation style icons. In this exhibition were represented many as world known fashion houses - Chanel, Christian Dior, Pierre Balmain, Yves Saint Laurent, Balenciaga, Nina Ricci, Jean Lanvin un Andre Courreges, as less known or even not known author products. 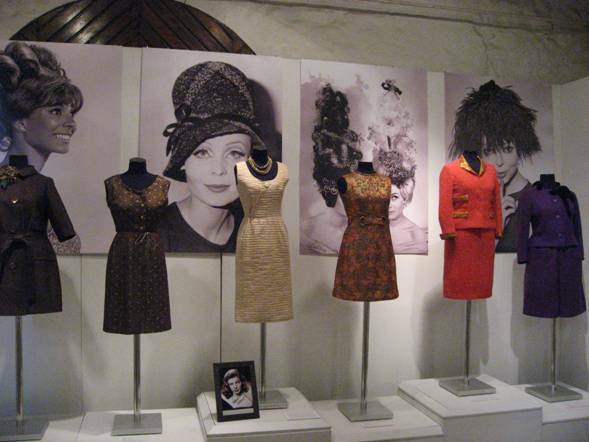 In centre of this exhibition was raspberry color wool evening dress (1963) from fashion house Pierre Cardin from Brooklyn museum collection in New york. Near it accessories – bright red handbags, hat, shoes and golden buckle. More one of my favorites Christian Dior evening dress and coat from turquoise and golden color silk brocade fabric (1964). Delight worth were other exhibition evening dress delicate pearl fancywork and bell-shaped cut, which, in my opinion, comes from much earlier times, but is in style even now. A little bit modern touch is scandalous Pop-art artist Andy Warhall mini dress with name Campebell's soup (1966). Pretty modern, sun and lemon tellow color saturated summer ensemble - mini dress and jacket from colorful flaxen pattern (1964). It's all from Madride Maruja Baena fashion house. • In make-up are accentuated eyes, artificial eyelashes, pale blue and white eye shadow on the eyelids, lashes dark lines, lips in flesh tone.